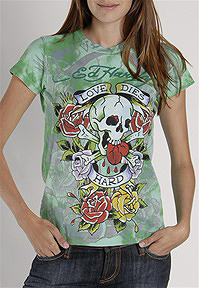 Brand explorations of choppers, hot rods, tattoos, pin striping and the art of kustom kulture: Don Ed Hardy and Von Dutch. How might that alignment be imagined — a link between the above? I’ve been exploring invented brand culture — that, in the one, might be aligned as partially invented — and, in the other, might be wholly linked to a previous, yet newly recalled, vitalized culture. That past culture might be the hot rod art of the 60s, or the car culture of the 50s, the interlacing of American and Japanese cultural links in the 40s, and so on. I’ve had the chance to work on brand development and evolution for enterprises that are hundreds of years old (Encyclopedia Britannica online conversion) to businesses that are more than one hundred years old (Capezio) to entities that are just starting up (Tableau). But it’s always about finding the story — who represents the founding of the culture and what the relationship to audiences might be. Who’s telling the story and who cares about it? 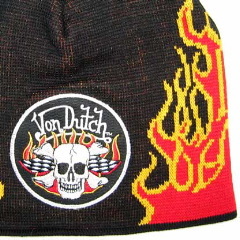 These are two stories, Don Ed Hardy and Von Dutch that I’ve been curious about. 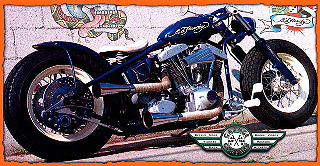 Mr. Hardy, as the website references — pulls from life experience to meld American, Japanese, Cholo, tattoo, surf and hotrod iconography. And I’d comment here that this is very much about the character of this exploratory, in brand, in personality — exploring and evolving brand culture. 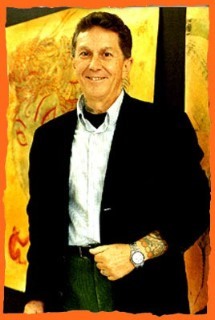 Hardy is a painter, printmaker and tattoo artist. Fascinated by tattoos since childhood, Hardy has become a master of his craft while continuing his work in the more traditional mediums of painting and drawing. Hardy’s work — as the brand originator — is represented in the collections of The Honolulu Academy of Art, The Contemporary Museum, Honolulu, The San Francisco Fine Arts Museum Achenbach Collection, and the University of Colorado Fine Art Galleries. This broad spectrum of taste and experience, coupled with an ongoing investigation of various art histories and a mastery of technique, give his work a unique range and depth. Jesse Hamlin notes: “his blazing images of devils, dragons, bearded ladies and Buddhas — informed by old master etchings, 12th century Japanese “hell” scrolls and 19th century woodblock prints, Southern California hot-rod striping and the funk and humor of Bay Area art — are widely exhibited and collected. 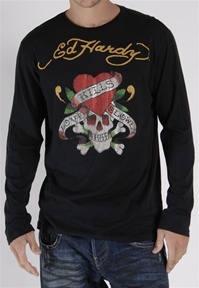 And for the past numbers of years, his early tattoo images, the “retro” skulls, sailor girls and derby-topped dragons now in vogue, have appeared on T-shirts, jackets, motorcycles and even energy drinks sold worldwide under the Ed Hardy brand. What’s interesting about this story is the cultural legacy of tattooing that led to the foundation of a brand – a premise and promise and a commercialized extension to culture. 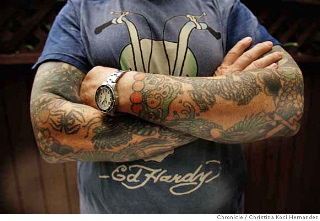 Don Ed Hardy is real, alive and still working. Don Hardy’s branding was taken up by another — Audigier’s marketing wizardry — who developed the brand into the expanded enterprise that it is today. One true story, comes out to another. That’s a differing proposition for another brand story, below. At once celebrated, yet challenged by darker legacies in the character of the man, his way of living and the brand principles therein. 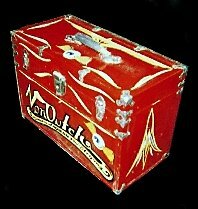 While Hardy’s presence is focused on an early fascination with marking the body with colored felt pens and Maybelline liner, creating his early tattoo art, Von Dutch’s character is entirely differing. 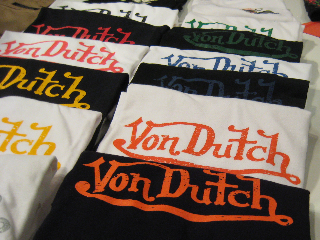 Von Dutch originates with the recognition of the revitalization of “kustom kulture”, a grouping car of enthusiasts that originates the hand built hot rods and muscle cars. His place in the opening action is nearly mythical — and the brand draws from his revolutionary service, dedication and (mis)adventures. 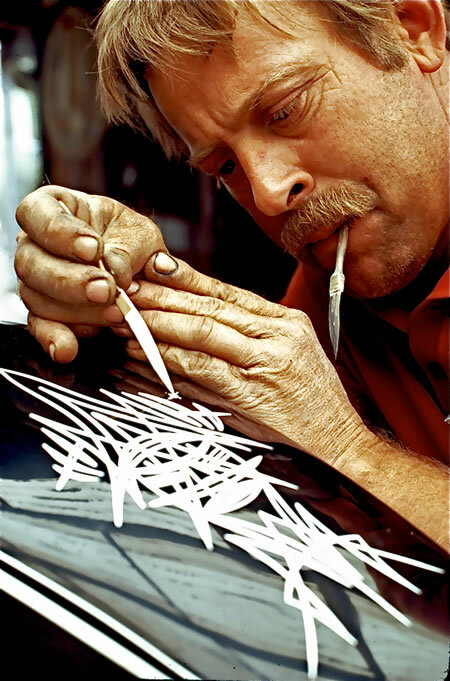 Dutch’s Dad was a well known designer, sign painter and goldleaf man in the South LA area known as Maywood. 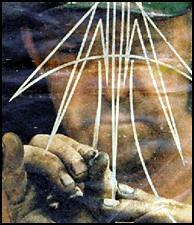 The well known Western Exterminator Logo is an example of his work that lives on today. “I’m a mechanic first,” he used to say. “But, for the next several years Dutch painted and pinstriped nothing but motorcycles, moving from shop to shop, saturating each area. 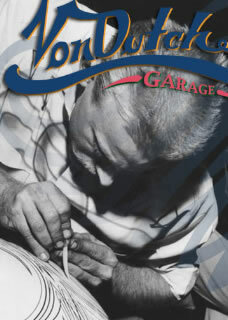 By the mid-fifties he had done thousands of bikes, but very few cars. 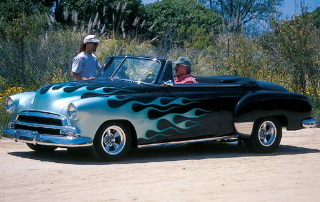 Striping cars started as a joke when he was working at Al Titus’ motorcycle shop in Linwood, California. The whole car striping idea started to ‘snowball’ and he was there. Part of the mythic character of Von Dutch was his nearly Zen-like aversion to success, coupled with a love of the bottle — equally legendary. Burns continues: “Despite his genius and popularity, Dutch never made any money from striping. Money was something he detested. In this quote from a 1965 article Dutch explains his thoughts on money. “I make a point of staying right at the edge of poverty. I don’t have a pair of pants without a hole in them, and the only pair of boots I have are on my feet. I don’t mess around with unnecessary stuff, so I don’t need much money. I believe it’s meant to be that way. There’s a ‘struggle’ you have to go through, and if you make a lot of money it doesn’t make the ‘struggle’ go away. It just makes it more complicated. If you keep poor, the struggle is simple. ” Still, there was a focus on the work — and doing good work, a kind of balance, perhaps, to the other negative characteristics. The Von Dutch Flying Eyeball logo. What’s the story with that well known icon? 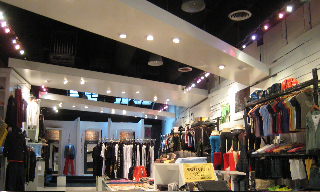 Phil Patton, a design commentator writes: “The daughters, Lisa and Lorna, were happy to sell the rights to reproduce their father’s imagery in 1996 to Michael Cassel, a maker of surf clothing, who established a company called Von Dutch Originals in 1999 and opened the store on Melrose Avenue a year later. 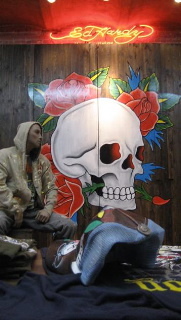 He brought in a man named Tonny Sorensen who in turn hired designer Christian Audigier. 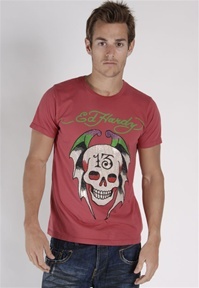 Audigier worked for Diesel and Fiorucci. Casel’s notion was to tap the hot rod set; but Sorensen and Audigier aimed at wider, fashion audience. 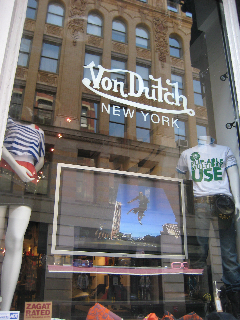 Who was Von Dutch? 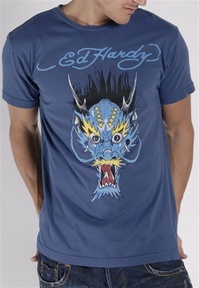 Who is Don Ed Hardy? What I’m looking for are stories — true stories. And the stories of Don Ed Hardy and Von Dutch are an interesting mix — one that exists in the present era; and another that captures a kind of wild and crazy semblance of the past — a person — and ultimately the telling of the story that remains. Both are true, both have a certain character — the febrile art fullness, the passion for the work, the exploration. 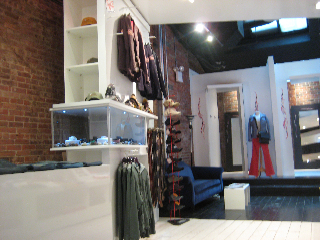 And they both have the connection of being built on Audigier’s bridging insight, expanded globally. What’s your take, what story do you relate to? What do you carry away?